Just about everywhere you go, you’ll find community grants being offered. 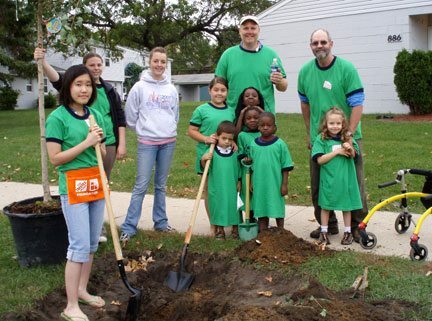 Community grants are offered to neighborhood groups, businesses, organizations, and sometimes to individuals for the purpose of improving a community. The community grants are seen as having a twofold purpose; they not only improve some aspect of a neighborhood, they also help bring together you and your neighbors, who might otherwise never really get to know each other. Community grants are typically offered as what’s called a matching grant. That means that you supply half of whatever’s needed for the project. Typically, how it turns out is that your half that you supply is the value of the volunteer labour that you arrange. For example you may receive a community grant to beautify your local park. Your city may agree to buy the trees, shrubs, flowers, and mulch. Then you arrange to have some local volunteers plant them. Usually they’ll provide money too for incidental expenses involved in the project, such as sunscreen, gardening gloves, bottled water, and other items that will be used. Just include them in your budget when you are making your grant request, and they’ll take the expenses into consideration when they’re deciding what will be funded. This is a type of grant that everyone loves. The government has money, and you have willing volunteers. As I’ve said before, grants exist to solve problems. In this case, the government has the problem of needing for the community to look nicer, but they may not have sufficient staff to do landscaping duties. You and your neighbours have the time, willingness, and capability to make improvements, but probably wouldn’t pay out of your own pockets to buy plants for public property. Therefore, through a community grant, everyone wins. The project gets done, you come together as a community and work alongside your friends and neighbours, and you get to enjoy the results for a long time. You not only get to enjoy the improved appearance of the green space, but you also will probably have a little surge of pride when you pass by the site of your project and know that you helped make it happen. Sometimes, you may also be able to even get a larger community grant or else have it renewed if you agree to perform maintenance, such as keeping your plant beds mulched and weeded, watering the plants, or cleaning up litter around the planting sites on an ongoing basis. If you do agree to do this, of course, make sure you follow through. You increase your chances of being approved for future and ongoing community grants if the local officials know that you’ll handle the funds responsibly. I suggest you take a look at the website of your local municipality to see what kind of funding may be offered. You could be the one to get the ball rolling and start a great project in your community that will improve your neighbourhood and strengthen the bonds between you and your neighbours. You Asked for It: More about Unexpected Government Grant OffersWhat Do You Do If Someone Offers You a Government Grant that You Didn’t Ask For?